After performing in many countries around South America and some cities in the United States, Pop Mexican singer and recording artist Luis Miguel will conclude his tour “The hits tour 2013? in Mexico next December. Luis Miguel known as “El Sol” will be performing in Tijuana, Mexicali, Metepec, Mexico City, Puebla, Queretaro, Veracruz, Villahermosa and Merida, Yucatan on December 20th at 9pm at the ”Carlos Iturralde” Stadium, with an absolute sold out expectation. Ticket Sales started on Saturday November 16th in the Farmacias del Ahorro and by Smart tickets. The day of the event the Stadium will be open at 5pm. Luis Miguel is the most famous Mexican singer, composer, and an icon in Latin America, with a mighty successful career, winning five Grammys and four Latin Grammys, is also considered one of the world’s best male pop vocalists. His contribution to Latin Pop music, along with his personal life, has made him a global figure for nearly three decades. 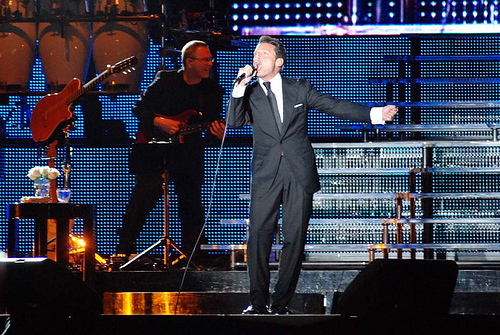 He won his first Grammy at age 14, Luis Miguel is the second artist to do so. In 1991, Luis Miguel’s career went to even greater heights and earned him the respect of a wider audience with the release of Romance, an album of romantic boleros, most of them from the 1950's and received recognition for selling 2 million copies of Romance and Segundo Romance. Luis Miguel has achieved Grammy and Latin Grammy awards, Billboard award, European Excellence artist, Estela de Plata award among others during his career.